I have been cooking along out of this gorgeously-written Nigel Slater tome for the past 6 months as part of I Heart Cooking Clubs. If you need a clear and direct recipe or photos in your cookbook, you may not love this book as much as I do. But, if you are like me and like to savor the writing in cookbooks like a novel and love to work with "sketches" of recipes, you will adore this book. I keep it on my nightstand and open it up and just read, as well as cook from it. Set up by month to follow a year in the kitchen, it is a treasure trove of Nigel Slater's thoughts and wonderful food writing.So far I made (and loved): Needs, Must Pasta (a simple and amazing fettuccine Alfredo): http://kahakaikitchen.blogspot.com/20..., Pasta with Creamy Basil-Caper Sauce (I keep making the sauce for pasta and fish and to top soup): http://kahakaikitchen.blogspot.com/20..., the intoxicating and addicting version of Bánh Mì (aka 'Sour, Hot, Crisp, Soft. A Sandwich for the Senses'): http://kahakaikitchen.blogspot.com/20..., a scrumptious lemon compound butter for fish: http://kahakaikitchen.blogspot.com/20..., and delightful Little Green Onion & Ricotta Omelettes with Asian Dipping Sauce: http://kahakaikitchen.blogspot.com/20... and I loved them all. I can't believe I've reached the ripe old age of 45 without owning any of Nigel Slater's books! I've heard him on the radio and thought his recipes sounded simple yet delicious, and now, finally, I am the proud owner of The Kitchen Diaries II. I go between wanting to keep this book in pristine condition for its whole feel and presentation - it could pass quite easily as an arty coffee-table book - or a working food-stained kitchen recipe book (I've just made the chocolate muscovado banana cake and the light spring onion omelettes, both delicious and to be made again and again). The recipes and engaging writing about food are set out by month, with simple, easily obtainable ingredients and no complicated messing about for hours in the kitchen either. Very highly recommended. 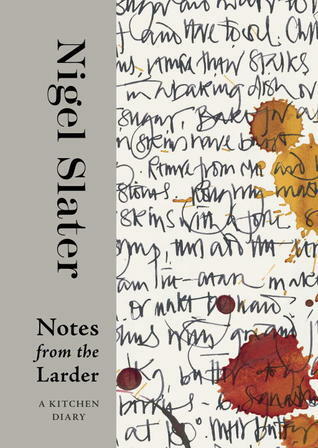 As the year comes to a close and we start on the path toward longer days and the coming of springtime, there can be no better book to curl up with than Nigel Slater's, “ Notes from the Larder, A Kitchen Diary,” published this fall in the United States. The cookbook received Amazon’s and Food and Drink's Book of the Year Award in the United Kingdom.For anyone not familiar with Mr. Slater, he is a self-described “writer who cooks.” A true Englishman who loves his garden and the seasonal pleasures of its bounty, Mr. Slater finds joy in calmly reworking recipes until they finally come together in a way that he deems fitting for that particular day, or moment in time: “What intrigues me about making something to eat is the intimate details, the small, human moments that make cooking interesting.”Mr. Slater is a BBC television series presenter and documentarian. He is author of eight cookbooks and a memoir, “Toast, “ which was recently made into a major BBC film. As the weekly food columnist with “The Observer Magazine” for over twenty years, Mr. Slater has a large and well-deserved loyal following. You can find his recipes and photographs of his food and garden at www.nigelslater.com.For me, the lovely muted photographs from both the kitchen and the garden were worth the price of the book. But it is his words, and his thorough enjoyment of the essence of the ingredients and how they come together, often quite simply, that create the true magical images set out on each page. I loved, loved, loved Slater's Kitchen Diaries. In fact, it is next to my sink where I look at it every few days to keep myself seasonally inclined for cooking. And, of course, for inspiration.When I saw that there was a second Kitchen Diary, it was at the perfect time. Just got another freelance job. So a little treat is in order. Right? Well, that's how it works in MY checkbook!======This doesn't have the complete charm of the original, but is still quite good. I'm reading along month-by-month so it will take a year before I'm done.=====Done! I stand by my statement above that it doesn't match the first Kitchen Diaries book. However, it is quite good and I have about 15 recipes marked to try out. A good deal of the charm, of course, is in Slater's poetic, evocative writing which is enjoyable whether one wishes to actually cook from this book or not.UPDATE 2014Stacked next to the bathroom sink as a bit of daily food reading before bed. Quite satisfying to reread this way and it serves the purpose of keeping me thinking seasonally. Love that. And Slater's "normal person" sensibilities. Another lip-smacking, inspiring tome from Mr Slater.His appeal is that he not a 'chef' ...rather a cook who is passionate about the foods and tastes that he discovers. He writes with such enthusiasm and sensory pleasure ...the idea of cooking his food is in your mind before you even see the recipes, you just want to share in the wonder of the experience!Alongside that, this is a beautiful book which aesthetically lures you in.. evocative pictures and colours. Impossible to resist. Despite its glorious grandeur you still want to cook from it immediately. The problem with checking Nigel Slater cookbooks out from the library is that I need time to really digest them. Though my natural inclination is to race through his books in a single sitting, I try to take them in small portions, a few pages (or meals) at a time, in order to maximize the pleasure of his writing, and the meals I imagine him eating, and the meals I imagine making as a result of my enjoyment of reading about them. Alas, this time taking it slow has resulted in fines. That'll teach me to just buy the dang book next time. I've got a confession to make. I'm in love with Nigel Slater's cooking and his recipes and he could come to my home and be my kitchen slave forever. Needless to say, despite ogling his dishes on the television, I bought his books. Well, I bought two: The Kitchen Diaries: A Year in the Kitchen (2005) and The Kitchen Diaries 2 (2012). Not only are they filled with great recipes but, importantly to me, the text in between the recipes is engagingly descriptive and effortlessly witty. Nigel Slater is my kind of cook as his recipes are straight-forward, easy to understand, and generally use ingredients that are either already in our cupboards, fridges and freezers, or readily available to most of us. I suppose I fell in love with Nigel's cookery skills by watching his television programmes. He has such a relaxed way about him, such an ordinary way of speaking to the viewer, such a no-nonsense approach to cooking, that he convinced me absolutely that 'I can do that'. Which actually remains to be seen, of course. His Kitchen Diaries books are like that. They are far more than just recipe books. They are, as they state, diaries. The narrative from the author, Nigel Slater, is almost poetic with descriptions of his garden, the plants, the weather, the shops that he frequents, the produce that he so loves. You can sit and happily read these books as if they were simply delightful novels that paint vivid pictures with words. They are treasures to be cherished. Really. " April 17... " Could there ever be the perfect day? Maybe not, but today is as close as it gets. Bright sunshine and cool breeze, the scent of wallflowers and narcissus on the air; a farmers' market with sorrel, young pigeons and good rhubarb, and an afternoon so hot and sunny you could fry eggs on the pavement. I gave in and bought my first tomatoes too, a vine or two of the early Campari... "As sometimes is the case with writers publishing a second book some years later, the recipes are not, in this case, a repetition of the first book with a few changes and really just ripping off the buyer. The paper quality is very good in both books, as are the plentiful coloured photographs (by Jonathan Lovekin) of the dishes. There is not, however, one photograph per recipe which might disappoint some but this doesn't really matter to me as Nigel's instructions are so very clear and there are so many recipes to enjoy that I don't think it would have been feasible to have a photo for each one. If I were to have one tiny complaint it is that the photographs have no caption so you have to match the recipe to the image, but the recipe is not far away and generally it is quite obvious at a glance. Nigel Slater has divided his book up into months although not necessarily one recipe for each day of the month, and there is an index at the back too if you are looking for a recipe that uses a particular ingredient. The 2005 book has 400 pages and the 2012 book has 544 pages in all. With regard to the 2005 book, I bought the paperback (for the sake of economy) and my 2012 book is the hardback version which has a nice satin ribbon for keeping one's place in the book. Both were at a great discount through Amazon. When I went to purchase them the older 2005 book, in the hardback version, was actually a lot more expensive than the hardback of the 2012 book, but I don't mind buying paperback books, especially quality ones. I found some magic in the chronology of the first book. The second book is still pretty charming though. I was a little horrified when I saw how long this book was after it arrived, but no matter - I flipped through it super quickly. Part Mark Bittman, part M.F.K. Fisher or Tamar Adler, this is a lyrical, seasonal approach to cooking that I thoroughly enjoyed, especially in this season of winter when I'm inside and yearning for a long, slow cooking process. There are many recipes in this book but they're almost all simple and accessible. The best part is truly the context surrounding each recipe, the slips of notes or brief page-long essays that muse on the seasons, focus on a particular kind of food, or simply say something about how the day went. I find reading diaries to be somewhat boring usually, but I really enjoyed that feel in this book - it made the recipes really come alive. This is a book for people who fancy themselves foodies, for chefs who track their progress, or anyone else interested in development over time and particularly how that relates to food. A simple, lyrical (but long) book - I really enjoyed it. This book is full of recipes I want to try, I am truly tempted by the excellent photography and style of writing, however the test is ultimately in cooking one of the recipes contained within. The pork and pear recipe got my mouth watering and tasted as good as was promised. So simple and appreciated by all the family. (which is a very big plus!) I really enjoy dipping into this book and the only downside is that I have borrowed it from the Library and at £30 a copy am unlikely to get the hardback version. Hence only four stars.Three weeks is not long enough dedicate to this book. I wonder how much the paperback will cost? Anything by Nigel Slater gets my vote. He's a real enthusiast for good food. I love to read cookbooks, even if I don't always use them for cooking, and this book is a record of Nigel's daily life with ad hoc recipes thrown in so it was fine for me, but I could see that some people might find that a bit irritating. I had to use a lot of post it notes to mark the recipes I'd like to try as it isn't set out in a conventional way. Loved, loved, loved. Nigel Slater has such a wonderful way of talking about food, cooking, gardening, and life in general. Every time I sat down to read a few pages, I felt cozy and comforted. And that's on top of all the delicious recipes that I'll have to try. Slater's approach to food is simple when necessary, extravagant when wanted, but always delicious. Can't wait to go back and read the first volume of his kitchen diaries. Another sheer pleasure from Slater. This series of diary could not be better in terms of book quality. Heavy paper, gorgeous photos, ribbon bookmarkers, pleasingly heavy to hold and a feast for the eyes. I don't know if I'll ever cook a Nigel Slater recipe, but. I think maybe that's not quite the point of these books. Lovely and loved. This is a cookbook that is full of essays on ingredients, along with recipes. I made the chocolate muscovado banana cake and it is delicious. Each chapter is a month of recipes so it will be a good resource for seasonal cooking. Beautifully written glimpse into the rhythms of a home cook throughout an entire year. The recipes are explained well and many of the recipes invite repeating in my own kitchen, including things that I would not have thought to put together or try as part of family meal time. Another wonderful collection of recipes and wisdom from one of our finest food writers. Some lovely accessible supper dishes. A great way to seasonally eat for the year. One minor criticism is that by adding some more photos would have turned this book from being wonderful to a Masterpiece ! I love this writing style. I can just hear him speaking. I like the recepies except that he weighs all of the ingredients including the flour in the baking ones. I can convert easily enough in the baking, but not the baking. Took a year to read as I tried to read it the same months as in the book. Enjoy Nigel Slaters writing. Very personal stories. Beautiful book. Love the paper in the book very good quality. Based on the book I have been watching some of his TV shows which I have also enjoyed. Very similar to his "The Kitchen Diaries," but I don't really care. I love the affectionate and reverent-yet-casual way he writes about food, and it's totally inspiring even if you don't tend to cook the way he does. Also, it makes me hungry. Have only had a chance to flick through and make a couple of recipes so far, but I love it! Brilliant book, just love the way he writes. Its a book for reading not just for the recipes. Although the recipes are pretty good as well. Love zinger Slater. It seems that he is speaking to you when you read any of his books. So passionate about food. Love reading it but haven't cooked from it. Now I've shared it with a friend, hopefully she'll cook from it. I just love Nigel Slater, what more can I say??? Nigel Slater - Nigel Slater is a British food writer, journalist and broadcaster. He has written a column for The Observer Magazine for seventeen years and is the principal writer for the Observer Food Monthly supplement. Prior to this, Slater was food writer for Marie Claire for five years. He also serves as art director for his books.Although best known for uncomplicated, comfort food recipes presented in early bestselling books such as The 30-Minute Cook and Real Cooking, as well as his engaging, memoir-like columns for The Observer, Slater became known to a wider audience with the publication of Toast: The Story of a Boy's Hunger, a moving and award-winning autobiography focused on his love of food, his childhood, his family relationships (his mother died of asthma when he was nine), and his burgeoning sexuality. Slater has called it "the most intimate memoir that any food person has ever written". Toast was published in Britain in October 2004 and became a bestseller after it was featured on the Richard and Judy Book Club. "I think the really interesting bits of my story was growing up with this terribly dominating dad and a mum who I loved to bits but obviously I lost very early on; and then having to fight with the woman who replaced her I kind of think that in a way that that was partly what attracted me to working in the food service industry, was that I finally had a family." As he told The Observer, "The last bit of the book is very foody. But that is how it was. Towards the end I finally get rid of these two people in my life I did not like [his father and stepmother, who had been the family's cleaning lady] - and to be honest I was really very jubilant - and thereafter all I wanted to do was cook. "In 1998 Slater hosted the Channel 4 series Nigel Slater's Real Food Show. He returned to TV in 2006 hosting the chat/food show A Taste of My Life for BBC One.Slater has two elder brothers, Adrian and John. John was the child of a neighbour, and was adopted by Slater's parents before the writer was born.He lives in the Highbury area of North London, where he maintains a kitchen garden which often features in his column.